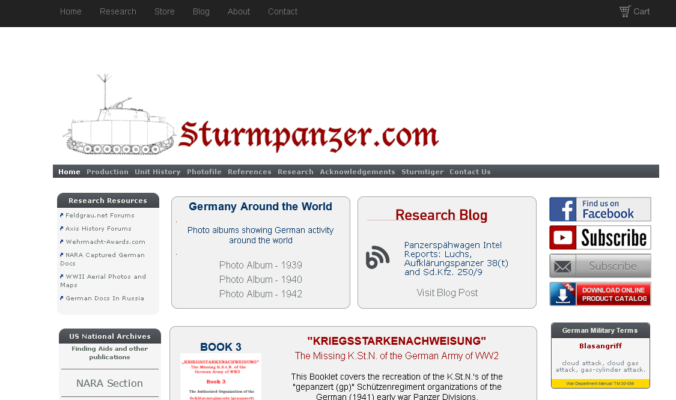 The recent news that Richard Hedrick, the owner of Sturmpanzer.com plans to discontinue the site as more than enough reason to point your attention to this trasure of research material. Nearly as old as the General Staff, Sturmpanzer owes its existance to a much nobler cause: scientific research. From its inception, the website has been tool as well as display of historical reasearch, only superficially centered around the German assault tanks based on the Tiger chassis, the “Sturmbär”. Pretty quickly the content broadened into archival and printed sources. However, Sturmpanzers main treasure trove are the extensive PDF catalogues of all things World War two contained in the National Archives in Washington, and a vast amount of German TO/E-Data, usually in the original form of the KStN. KStN is german and short for Kriegsstärkenachweis, which I would translate to “war/mobilisation strength rooster”. Before and During Second World War they served as the basic inventory and structure information of any german unit, and their continuous updates reflect the German Armys response to the requirements of war. Last but not least, in the past years the research blog has been another rich source of Data, Insights and thoughts about – mostly – the german Army in World War Two. I highly reccomend a visit before its taken offline.